Hi! I'm Charles Scott and I'm Sho Scott (age 8 in 2009). 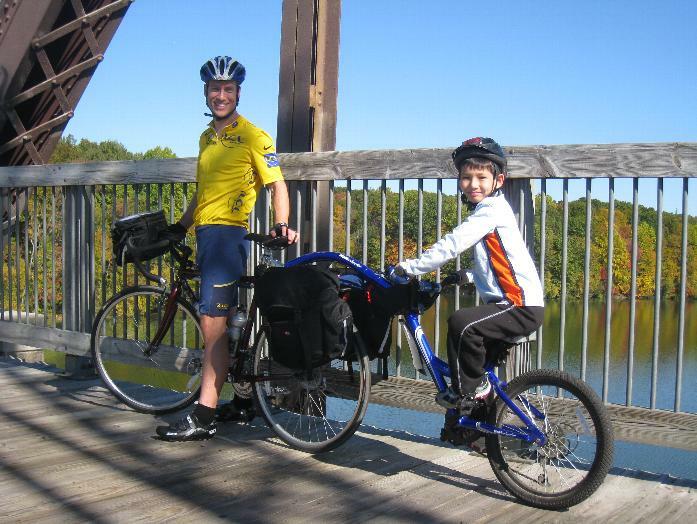 In the summer of 2009, we rode connected bicycles the entire length of mainland Japan, about 2,500 miles (4,000 kilometers), becoming, as far as we know, the first father-son pair to ride connected bikes from the northern cape to the southern cape of Japan. Sho is also likely the youngest person to ride a bicycle the length of Japan. The journey took us 67 days, and we rode over 10 mountains! Working with the United Nations Environment Programme to use publicity from the ride to encourage action on climate change, we named our ride, "UNite to Combat Climate Change - Ride Japan." We are raising money to support a worldwide tree-planting effort that aims to plant 7 billion trees, one for each person on the planet. Click on the "Donations" tab above if you would like to make a contribution, or on the widget below. We blogged during the ride at: http://japanbikeride.blogspot.com. Check it out! The next section includes a description of our adventure in Japanese. We would like to promote cycling as a healthy alternative to driving, encourage parents and kids to dream up their own family adventures, and demonstrate that young people are capable of extraordinary achievements. Click on "What's your adventure?" above to join the discussion forum.